A wholphin or wolphin is a rare hybrid, formed from a cross between a bottlenose dolphin Tursiops truncatus (mother), and a false killer whale Pseudorca crassidens (father). Although they have been reported to exist in the wild, there are currently only two in captivity, both at the Sea Life Park in Hawaii. The first captive wholphin hybrid was born in 1985 where a female bottlenose dolphin and a male false killer whale shared a pool. The wholphin's size, colour and shape are intermediate between the parent species. Named Kekaimalu, she has 66 teeth - intermediate between a bottlenose (88 teeth) and false killer whale (44 teeth). 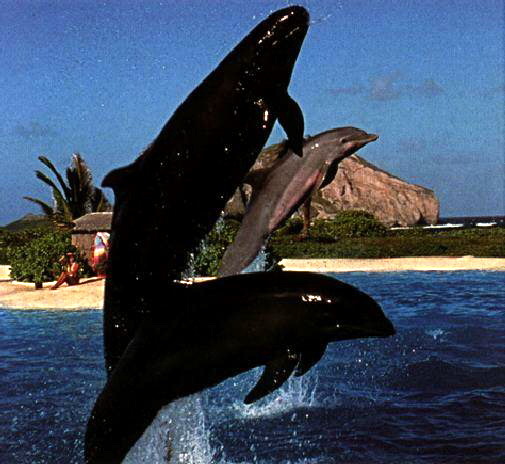 The wholphin proved fertile when she gave birth at a very young age. Unfortunately, the calf died after a few days. However, in 1991, Kekaimalu gave birth once again, to daughter Pohaikealoha. For 2 years she cared for the calf, but did not nurse it (it was hand-reared by trainers). Pohaikealoha died at age 9. On December 23, 2004, Kekaimalu had her third calf, daughter Kawili Kai, sired by a male bottlenose. This calf did nurse and was very playful. Only months after birth, it was the size of a 1-year-old bottlenose dolphin. Both remain in captivity, and are not part of the normal tour at Sea Life Park. The backstage tour must be taken to see the wholphins. Keikaimalu is featured in the main dolphin show at Sea Life Park. Wholphins, though not commonly sighted by fishermen, are known in popular seafaring lore as "The Great Grey Beast". Although the word 'wholphin' is a portmanteau of whale and dolphin, since false killer whales are members of the family Delphinidae, that is, dolphins and not true whales, the wholphin is a kind of dolphin. For more detail on the ambiguity of the term, see whale. Herds of false killer whales and bottlenose dolphins associate together in the wild and there are unsubstantiated reports of natural hybrids between the two species.